Current: Waste: What goes where? 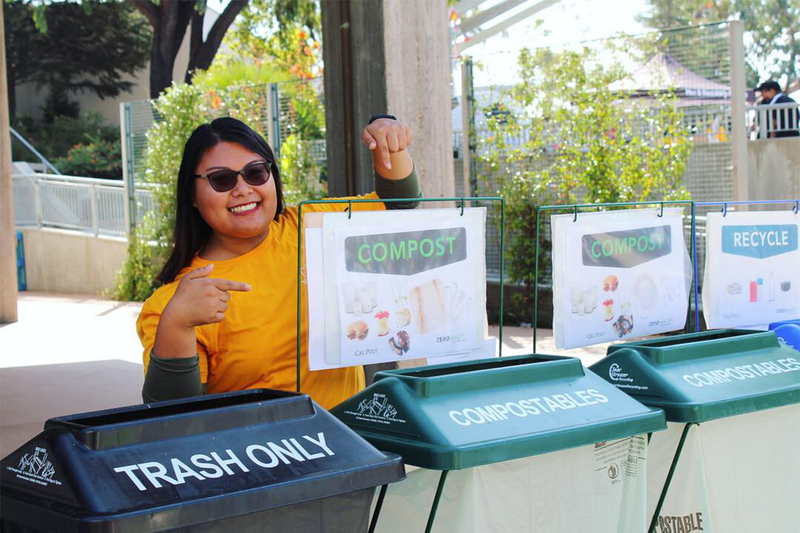 Educating our community on which type of waste should go where is critical to becoming Zero Waste at Cal Poly. Follow the steps below when you are throwing something away. First, ask yourself is it reusable? Many items can be reused or repurposed instead of being thrown away. For example, refill your drink cup next time you are thirsty or save that subway bag for the next time you get a sandwich! For a more comprehensive list of what is recyclable at Cal Poly and throughout SLO County, visit the Integrated Waste Management Authority (IWMA) website. Is it hazardous waste or materials that requires special handling? Batteries may be recycled by placing in an envelope and mailing or delivering to the Cal Poly State Warehouse, adjacent to Building 70. E-Waste such as computers, power strips, cell phones, and other electronic devices – should never be thrown in the garbage. Cal Poly electronic waste is collected in the same manner as other campus surplus property. Visit the Cal Poly Moving and Surplus site to determine the appropriate procedure for “state tagged or non-tagged miscellaneous surplus items” or contact the Moving and Surplus office at 805-756-5449 if you have questions. Fluorescent Tubes contain mercury and should be delivered to the State Warehouse for proper disposal. Compact Fluorescent Lamps contain mercury and should be delivered to the State Warehouse for proper disposal. Printer toner cartridges will be recycled rather than ending up in the landfill with the Clean Planet Program from Konica Minolta. Ultrex, Cal Poly’s photocopier provider, will place a Konica Minolta Clean Planet Box by each machine for all empty toner cartridges – Konica, Dell, HP, Brother, etc. Ultrex will collect the full boxes monthly. However, if the box is getting full before your monthly visit, the end users can contact Ultrex directly by emailing Melissa at Melissa@ultrex.net. Asbestos and Lead may only be handled by trained and certified personnel. If you believe asbestos or lead containing materials have been damaged or disturbed, please contact the work control center at 805-756-5555 or Environmental Health and Safety at 805-756-6662. Chemical waste is handled by the Environmental Health and Safety office. If you need to dispose of chemical waste, please contact the work control center at 805-756-5555 or Environmental Health and Safety at 805-756-6662.